VIEWS! VIEWS! VIEWS! 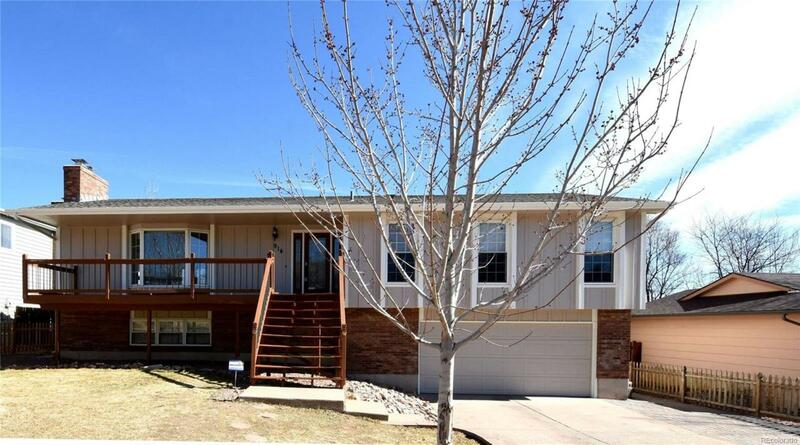 See forever from this ABSOLUTELY STUNNING COMPLETELY REMODELED - RANCH HOME! ***Great-room concept! ***Leaded glass front door w/leaded side lights. ***Nice size flat, private rear yard. ***You wont believe the outside deck space! 340 SF in the rear. 88 SF in the front. ***SEE FOREVER from your rear deck. Great for enjoying the cool Colorado evenings! ***Extras: See forever City VIEWS from rear of the home! CENTRAL AIR CONDITIONING! Security System! Whole House Fan! Auto Sprinks! Oversize Two Car Garage! WHATS BRAND NEW: Exterior Paint! Interior Paint T/O, Beautiful Carpeting, 6 Panel Doors T/O! 5 Base Molding on Main Level! Hi-End Light Fixtures! Window Treatments T/O! Door Locks! Attic Insulation! Window Moldings! ***What more could you want! Truly an exceptional home and a rare find, indeed! Make this your home, today! See suppliment for recent remodeling and upgrades.